Ontario curling fans finally know whom they’ll be cheering on when the 2013 Scotties Tournament of Hearts gets underway at the K-Rock Centre in Kingston on Feb. 16. 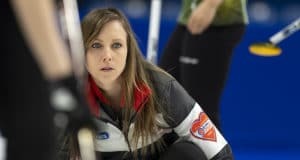 After a last-rock loss in the 2012 provincial final, Rachel Homan rolled through the field with an unblemished record during this year’s playdowns, Jan. 21-27 at the KW Granite Curling Club in Kitchener-Waterloo. 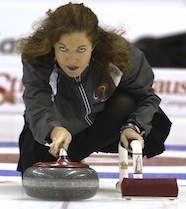 It marks the second appearance at the national championship for the young skip from Ottawa, the first coming at the 2011 Scotties in Charlottetown. Homan secured a spot in the final by blanking Cathy Auld of Mississauga 9-0 in the 1 vs. 2 Page playoff game. Auld bounced back to defeat Sherry Middaugh in the semifinal for a shot at the provincial title. 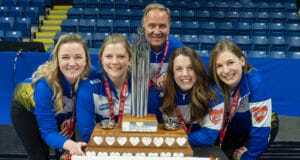 In the championship final, Homan – a three-time representative for Ontario at the Canadian Junior Women’s Curling Championship – defeated Auld by a 7-3 score. Homan leads teammates Emma Miskew, Alison Kreviazuk and Lisa Weagle into the 12-team field that will compete for the Canadian Women’s Curling Championship in Kingston from Feb. 16-24. Defending champ Heather Nedohin of Edmonton was the first qualifier, wearing Team Canada colours this time around, followed by Kerry Galusha of the Northwest Territories/Yukon, Kelly Scott from B.C. and Newfoundland/Labrador’s Stacie Devereaux. Six other provinces also declared their representatives Jan. 27 – a super Sunday for the Scotties. Manitoba’s Jennifer Jones will be there for a 10th time, Suzanne Birt returns for Prince Edward Island and Allison Ross won in Quebec. Mary-Anne Arsenault, with Colleen Jones throwing third stones, took the Nova Scotia title, Kristie Moore won her first Alberta title as a skip (she competed as a second in 2000) and newcomer Jill Shumay came out on top in Saskatchewan. The New Brunswick playdowns, Jan. 30-Feb. 3 at the Gladstone Curling Club in Fredericton Junction, will determine the final team that earns the right to play for the most prestigious championship in Canadian women’s curling. “You Gotta Be There” for the 2013 Scotties Tournament of Hearts in Kingston’s K-Rock Centre. A great selection of the best seats in the house are available now, just by clicking here. Previous: Introducing Curling TV: a new way to watch curling on-line!